Her story is one manifestation of why EVERY. SINGLE. DAY. I ask you, implore you to think for yourself and fight for your education. When Malala Yousufzai and a friend were on their way home from school in Mingora town, gunmen open fired on them and Malala was hit by two bullets. 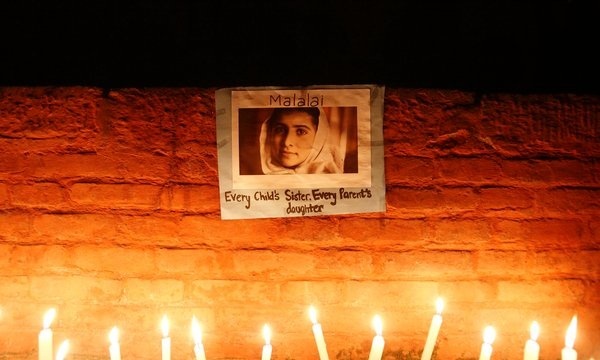 We hear from our friends at AI that the Taliban have claimed responsibility for the shooting, and one local report even suggested that the gunmen asked Malala for her name before opening fire. Malala is now being treated in hospital for her wounds, but the Taliban militants say that if Malala survives, they will target her again! Malala, is a youth activist, who has campaigned for girls’ right to education in her region since she was 11 years old. Her father runs one of the few girls’ schools in the Swat valley even tho their family receives threats from the Taliban. To read more letters for malala, click here. PRIMARY 6 students should read about Malala and write her a letter of support. Post the letter on the "Letters for Malala" link and copy and paste it on the thread in "Have your say!" Malala Yousafzai is a 14-year-old Pakistani girl who has become known around the world in recent years for advocating for education (especially for girls) and condemning Taliban subjugation. As a result of her outspokenness she was shot by Taliban in the head and neck on her way to school last Tuesday. Thankfully, she wasn’t killed; she is now in critical condition at a hospital in England. You are a true hero, and you do it without guns or violence. When I think of your life and what you have done for girls of Pakistan and across the world, all at the age of fifteen, it is truly inspiring. You are my idol, and I hope to one day be like you.